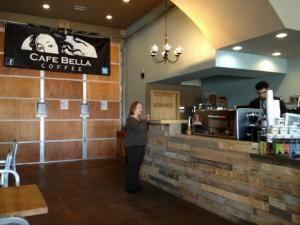 Cafe Bella Coffee space is available for rental during off operational hours. Contact Direct at Cafe for rental info. Birthdays, Celebrations, Meetings, Presentations, Reunions, Anniversaries, and other occasions that require a neutral inside location now have a new venue option. Our Cafe offers casual seating for up to 55 guests.in our 1600 square foot facility, ample parking, handicap accessible, with both male and female restrooms. Additional services available: In house Catering: Beverages: Cafe Bella Coffee excels in Coffee service for your special event ranging from self serve drip coffee stations to a staffed artisan espresso service. Non coffee beverage are also available. Food: Our Executive Chef is well versed in a wide range of catering options for your private function at Cafe Bella Coffee. Hot or Cold fresh Appetizers, Salads, Soups, and desert items are all possible. To schedule a site tour of our facility or to gain pricing information please contact Michael Gonzales directly at *NOT DISPLAYED* or call our Cafe direct at *NOT DISPLAYED* during our normal business hours, we are happy to assist you.